A group of Eastern Mennonite University students gathered outside of Lehman Auditorium before and after a November campus worship service featuring visiting theologian N.T. Wright to draw attention to his refusal to meet with them. Their mouths covered with rainbow duct tape, approximately 18 members and allies of Safe Space – a support group for the LGBTQ community on campus – stood after the service with arms linked in a silent, outward-facing circle, while other students nearby displayed rainbow flags. During their performance before N.T. 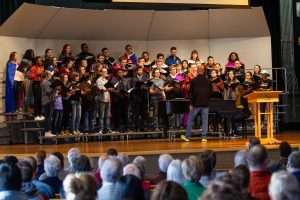 Wright’s chapel lecture in Lehman Auditorium, some members of the University Choir showed support by wearing Safe Space t-shirts and flags around their shoulders. Emily Powell, a senior who co-leads Safe Space, said members of the group first became concerned about Wright’s visit to campus after learning in late August of “derogatory and dehumanizing” comments made by him about the LGBTQ community. Wright came to Harrisonburg for a two-day, five-lecture series that drew widespread interest. A pastors’ breakfast was attended by 140 area church leaders, and later audiences filled James Madison University’s Memorial Hall and Eastern Mennonite Seminary’s Martin Chapel. Currently the research professor of New Testament and early Christianity at the University of St. Andrews in Scotland, Wright has also been Bishop of Durham and a professor of New Testament studies at Cambridge, McGill and Oxford universities. His visit was sponsored by the Missional Church Partnership coalition, the Augsburger Lecture Series and Aubrey Spears, rector at the Church of the Incarnation and Café Veritas. Safe Space communicated through Campus Pastor Brian Martin Burkholder an invitation for conversation with Wright, but Wright declined meeting to discuss issues of sexuality. Wright’s refusal was concerning to a number of faculty, including Professor Deanna Durham, who serves as Safe Space faculty adviser. In the months leading up to Wright’s visit, numerous formal meetings and discussions occurred, including when President Susan Schultz Huxman and Vice President for Student Life Jim Smucker hosted members and allies of Safe Space in a listening session. Safe Space invited the Augsburger Lecture Series committee, members of the convocation committee, and queer students and their allies to join a circle process about Wright’s visit. As during other campus worship gatherings, alternative worship sessions were offered, including “Queer and Christian: A Staff Faith Story.” Other Safe Space events planned during the week included a viewing of the documentary Believer and a time of hearing stories from the LGBTQ community. Not all campus worship attenders were supportive of the protestors. One who repeatedly addressed the protesters was diverted by an affiliate in campus ministries and faculty members. 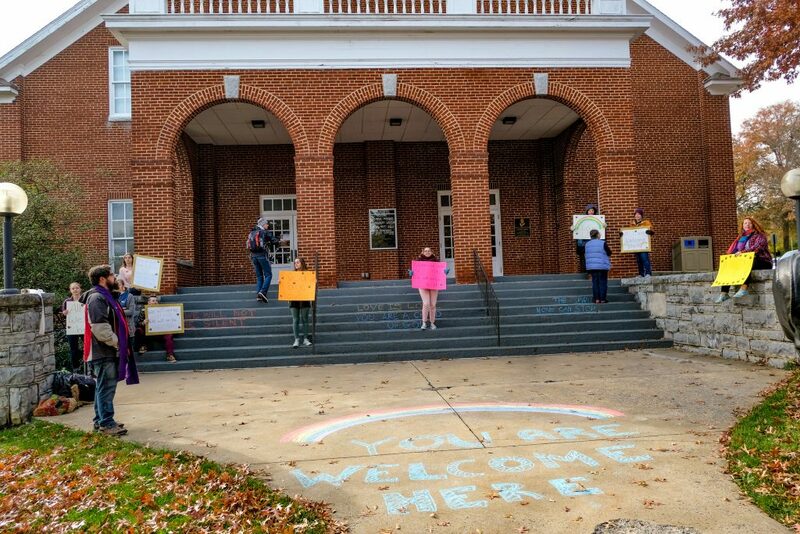 In the 24 hours following the Safe Space action, several of the chalk messages the group had written on campus sidewalks for the protest were changed. In a campus-wide email, Huxman identified the changes as hate speech. This article touts EMU’s expertise in “dialogue and facilitation.” Yet the question posed to Wright effectively tars and feathers him with “hatred and discrimination” as the starting point for dialogue. What theory of dialogue licenses such a defamatory approach? Safe Space essentially asks how Wright could reconcile himself to being an evildoer. Why should Wright, or anyone, respond to such a set-up question? I’d like to see Wright’s “derogatory and dehumanizing” comments for myself, please. This article calls into question EMU’s judgment — not simply about Christianity, which would be bad enough, but also about its own touted expertise in dialogue facilitation.